You’ve probably heard of Industry 4.0, the Fourth Industrial Revolution. Often accompanied by tech buzzwords about optimizing production, becoming more agile, and predictive analytics, the term comes from a manufacturing strategy developed by the German government to increase computerization in factories. Digital automation in industry and manufacturing has also been discussed at the well-known German trade and technology show Hannover Messe since the early 2010’s. In 2019 you’re as likely to hear about Industry 4.0 in casual conversation as in technical publications. But what exactly does it mean? What does it look like in practice? What are the implications for the workforce? The Industrial Revolution took place from the mid-18th Century to the 1830’s and 1840’s. It completely changed production and the nature of work with steam- and water-powered machinery in factories and textile mills. The Second Industrial Revolution, roughly 1870 to the start of World War I, brought mass production and assembly lines into factories, along with electrification of machinery. Starting in the 1980s, computers and large-scale robots marked the beginning of the Third Industrial Revolution. We hear about data all the time on the news and we know that companies and organizations use data to send us targeted marketing messages, suggest Google search terms, and even detect suspicious bank account activity. But what role does data play in modern industry? Machine learning takes it one step further. As artificial intelligence improves, computers can recognize patterns and make decisions similar to how a human would. As more data is included in the calculations, those decisions get closer to what people would have made given enough time to review and reflect on the same data. Robots programmed to sort items, pick the correct box off a shelf, and stop moving when a human enters the work area are all examples of data-driven decisions that machines can make. Most of this data is stored “in the cloud”. All that means is that data is stored on large servers at remote locations instead of on a “local” computer’s hard drive in your office. The data can be accessed through the Internet from any location or device with the correct software or app. In theory passwords and encryption keep one person’s or company’s data accessible only to them, but it’s no secret that data often left unsecured may be stolen. We’ll discuss cybersecurity in detail in a future post, but it’s important to remember that data is always vulnerable to some degree, and sensitive data (i.e. employee information, account numbers, operations details, etc.) must be protected carefully. What Makes a Factory “Smart”? 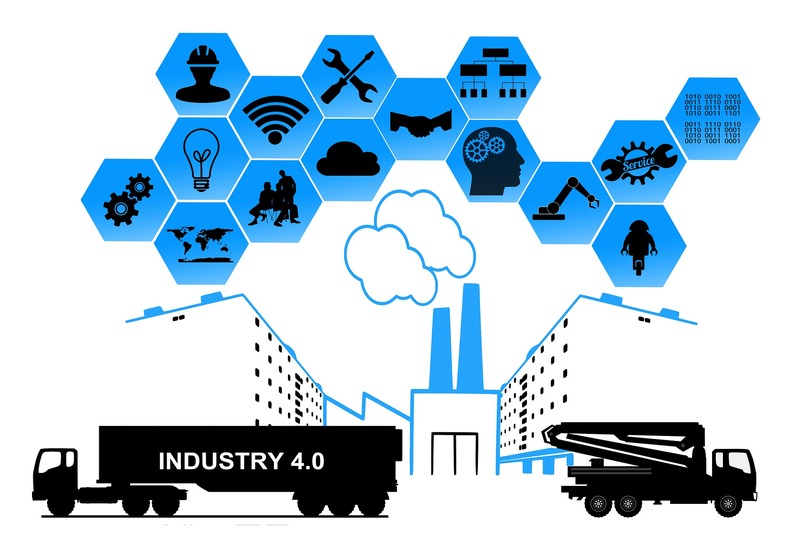 Smart factories use equipment and devices that are connected to each other to gather and analyze production and operations data. This can include computers, sensors, cameras, measurement devices, databases, and more. They also use automated communication tools to let workers share information, ask questions, or contact other departments quickly. According to research by consulting firm McKinsey, “as many as 375 million workers—or roughly 14 percent of the global workforce—may need to switch occupational categories as digitization, automation, and advances in artificial intelligence disrupt the world of work.” Despite this, notes an article on Recode, just because a job or task can be automated doesn’t mean it will. It's expensive to integrate new technology and takes time for it to fully take hold across industries. What’s more, the social complexity of a job is hard to reduce to numbers for an accurate prediction about how “automatable” it is. Jobs requiring persuasiveness or ability to smooth over conflict might never be the domain of AI. Far from declining, “American manufacturers have actually added nearly a million jobs in the past seven years,” says the Seattle Times. But the skills required for these jobs are changing due to evolving technology. For example, computerized equipment could mean that a single worker can operate five workstations instead of one, as long as he or she has the right skills to use and troubleshoot the software. Retraining or “upskilling” can help workers transition to this kind of work. Some in the field point to misperceptions that keep students from considering manufacturing work. Industry Week cites survey findings that 70% of respondents believe American manufacturing is in decline. And, “there’s a perception that manufacturing jobs are repetitive, monotonous, underpaid, and involve working in decrepit, dirty factories,” and this perception has been passed on to younger workers and students. If companies can counter these attitudes and show how manufacturing work has been modernized with digital technology, it just might encourage more interest in the field going forward. Industry 4.0 is complex and evolving, and we hope we’ve improved your understanding of it. Need more help making sense of the world of work? Contact us today – we can help!